Ousted Egyptian president's murder adjourned to Tuesday after "bad weather" prevents him from being transported from prison to court. An Egyptian court on Sunday adjourned the murder trial of deposed president Mohammed Morsi to Tuesday, after "bad weather" prevented him from being transported from prison to court, AFP reported. 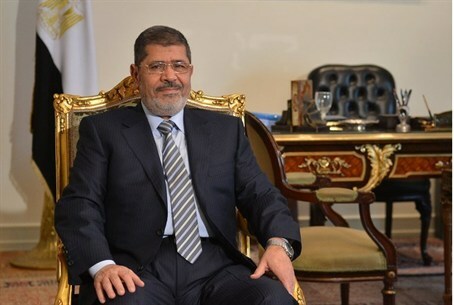 Morsi, who was ousted by the military in July, is accused of inciting the killings of opposition protesters outside the presidential palace in December 2012. The area around the Cairo police academy where the hearing was due to be held on Sunday was hit by strong winds, AFP reported. "The court adjourned the trial to March 4 as bad weather prevented Morsi from being brought to court," a security official told the news agency. Authorities transport him to court hearings in a helicopter. Morsi is usually held in a prison in the Mediterranean city of Alexandria, but he spent the night at a Cairo prison after attending a session of the murder trial on Saturday. The murder trial is one of three cases already opened against the toppled president, while a date for a fourth trial has yet to be fixed. The trials are part of an government crackdown on Morsi and his Muslim Brotherhood movement since the army overthrew him on July 3. In a hearing in this trial last week, prosecutors accused Morsi of leaking state secrets to Iran's Revolutionary Guards as part of a plot to destabilize Egypt.